The James Tiptree, Jr. 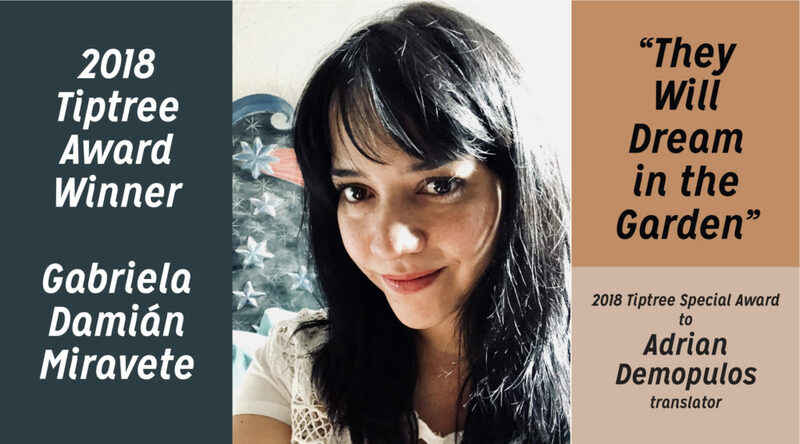 Literary Award Council has selected Gabriela Damián Miravete as the winner of the 2018 Tiptree Award for her short story “They Will Dream In the Garden,” translated by Adrian Demopulos and published online by Latin American Literature Today (May 2018). 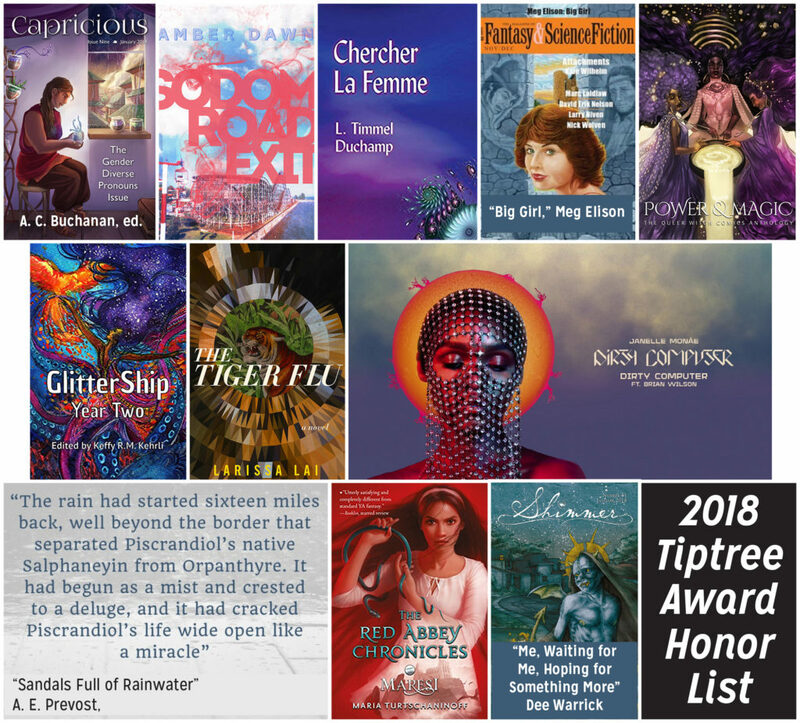 The James Tiptree Jr. Award is presented annually to works of science fiction or fantasy that explore or expand the understanding of gender and gender roles. …A beautifully written and translated story [that] uses the future tense to imagine a Mexico in which femicides are already part of history. In a collective attempt by survivors to preserve memory and justice, traces of the minds of the murdered women are encapsulated in interactive holograms “living” in a beautiful garden. The story looks at the economic, social, and racial dimensions of violence against Mexican women today, focusing on indigenous women, poverty, and unemployment, on repression of women’s educational opportunities, and of women’s ability to move about freely. The story hints at positive change as some women decide to fight back through collective action, mutual support, and self-defense, eventually shifting the public perception of gendered violence and improving the actions of the next generation. By offering a possible look into the future, far from giving the sense of a closed chapter, the story itself is a device of memory preservation, a call to action, and a fine example of science fiction as a tool for feminist exploration and social change. Each year, a panel of judges selects the Tiptree Award winner. The 2018 judges were Margaret McBride (chair), Marina Berlin, Ritch Calvin, and Arrate Hidalgo. The 2019 panel of judges will be chaired by Carol Stabile, and reading will begin soon. A collection of delightful, thought-provoking stories that fulfill the intended purpose of normalizing diverse pronouns as well as suggesting that the binary can be broken or even left behind. Buchanan writes: “In English, the personal pronouns we’re most used to are he and she. Not only do these require the speaker to know the gender of the person they’re talking about, but they only properly cover two genders. Humans don’t always fit in these boxes.” This collection addresses thecomplaint that people find it hard to learn new pronoun sets. Buchanan writes that the answer is to normalize new pronouns — “in conversation, yes, but also in our stories, in fiction, in all media. In stories about spaceships and about magic, heroism and exploration, families and home.” As an added bonus, the authors and editor make recommendations for other works to read. This ghost story set in a small depressed Ontario town in the 1990s explores concepts around sexual agency and slutdom with extraordinary doses of humanity, humor, and lyricism. With issues of women’s sexual autonomy being currently (and always) very much under the spotlight, the author presents myriad ways in which the book’s characters’ sexualities clash with (or struggle under) patriarchal power structures and lays them across queerness, whiteness, poverty, religious and moral values, and public opinion. Through the eyes of the protagonist and of the queer ghost who is haunting her, the reader experiences the pains and thrills of inhabiting a gendered, sexualized, queer body in this story full of caustic language and powerful images. WARNING: descriptions of child sexual abuse and adult suicide. This cerebral, investigative novel presents a future society in which humans have divided into Paxans and Outsiders. Paxans are committed to “a collegial, laterally organized meritocracy.” In this technologically advanced society, Paxans spend only a small portion of their lives in “meatspace” and the majority of their lives in virtual realities, inhabiting and conversing with their secondary and tertiary bodies, which represent selected and isolated aspects of their consciousness. Paxans have been given FTL travel by an alien race they call Delta Pavonians, and some women, cis and trans, are able and willing to undergo body modification and training to be able to communicate with the aliens. The story traces the mystery of a second alien planet, La Femme, and its telepathic inhabitants. The novel is an absorbing exploration of the many ramifications of the notion of gender and the myriad ways in which it is represented and exploited. A story about a common problem in society—fat shaming. This is especially a problem for women, both white and of color, and for teens who lack self-confidence and easily fall prey to ads and movie portrayals. With satirical condemnation of society and media reactions, this story portrays how internalizing the perceived norms of “feminine” leads to low self-esteem. As the cover promises, so the book delivers: 15 graphic short stories by “seventeen women, demigirls, and bi-gender creators of color.” The rich heart-warming fantasy stories deal with folk tales, fairy tales, disability, immigration, race, grandmothers, baking, depression, romance, and much more magic. This anthology is a good way to find authors you’ll want to read again, and a great display of the dramatic potential and innovative storytelling in contemporary comics today. An anthology of over 30 short stories and poems. About half were originally published in Glittership Magazine, and all have queer themes and characters. “The Little Dream” by Robin M. Eames (in which a character wears a t-shirt that reads “IN SPACE NO ONE CAN HEAR YOU INSIST THERE ARE ONLY TWO GENDERS”) and “Graveyard Girls on Paper Phoenix Wings” by Andrea Tang are particularly recommended. A wonderful variety of stories and a great way to find authors you want to read more of. Because of a plague that kills men more frequently than women, one society in this polluted future has mostly women. But men still have more power and women still need to fear sexual assault. The other society is all women — many with special powers, including doublers who have multiple clone births, “starfish” who can grow new body parts, and girls given special treatment so they can help breast feed the multiple babies. The religion is Mother-based. A beautifully written novel. This album follows the struggles, joys, incarceration, and eventual liberation of a queer, Black woman who is punished by a system that seeks to “cleanse” her of all elements in her life that deviate from the norm. She is sent to a prison in which her memories (each of which is a separate music video and an ode to mutual love in rebellion) will be erased. The workers in charge of the erasure, who sit back and enjoy the memories prior to destruction, serve as a sharp metaphor of the white supremacist, cisheteropatriarchal system that is obsessed with Black bodies and creativity while still remaining profoundly anti-Black. This concept album forms a cohesive science fictional narrative, introducing futuristic elements in a way that is rarely seen so explicitly in the medium, opening up new pathways for the musical exploration of feminist science fiction. This story portrays a culture in which gender pronouns change depending on a multitude of factors for each individual at any given time. This story shows a character at the beginning of a new life whose sense of identity is affected by this new language with a multitude of unfamiliar pronouns. The story also touches on issues of immigration, poverty, unemployment, romance, and building a new family. The reader is given linguistic issues and endearing characters in a well-done story. This young adult novel was translated from Swedish. In it, a society of women (in groups acknowledging the Maiden, Mother, and Crone) live apart from a patriarchal world. They populate their society by rescuing women and girls from poverty, evil men, and lack of education. The leader of the Abbey is the First Mother. This story is told in the time of the 32nd First Mother. The women of the Abbey preserve knowledge within a vast library. The novel ends with the narrator, a teenage girl, deciding to go back out into the world to see if she can help change how men and women see themselves and one another. This visceral story with vivid writing explores in a literalized way the dysphoria that can come with being trans. The monster in the basement works as both a powerful metaphor and a plot device. The Tiptree Award judges also recognize Adrian Demopulos, the translator of “They Will Dream in the Garden,” with a special honor for a wonderful translation. 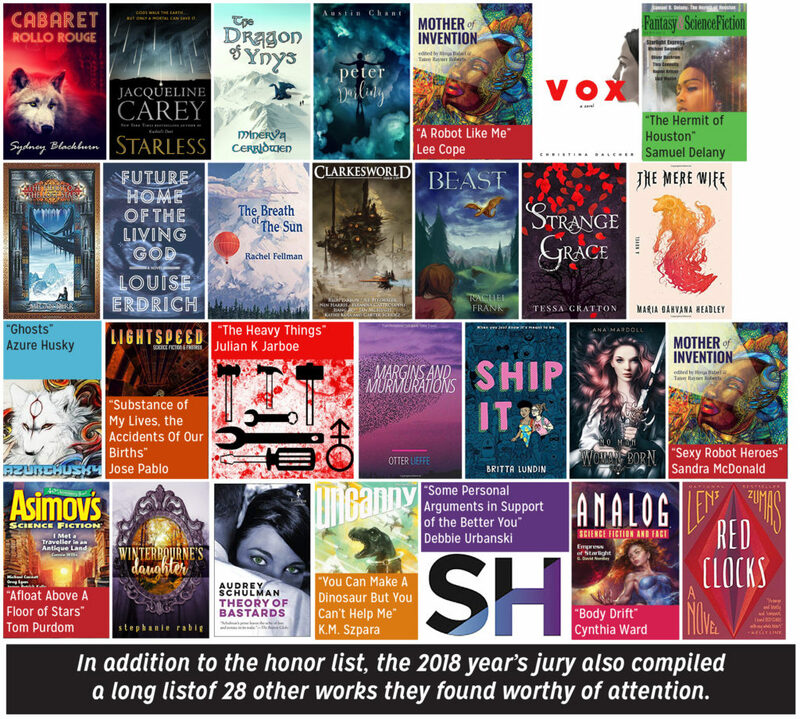 In addition to the honor list, the jury also compiled a “long list” of twenty-eight other works they found worthy of attention. A complete list with publication information can be found at on the Tiptree website here. The Tiptree Award winner, along with authors whose works are on the Honor List, will be celebrated at WisCon in Madison, Wisconsin during Memorial Day weekend. The winner will receive $1000 in prize money, a specially commissioned piece of original artwork, and (as always) chocolate. The Tiptree Award invites everyone to recommend works for the award. Please submit recommendations via the recommendation page of Tiptree Award website. On the website, you can also donate to help fund the award and read more about past winners and works the Award has honored. More background on the Tiptree Award: For more than 25 years, the award has been seeking out work that is thought-provoking, imaginative, and perhaps even infuriating. Its goal is to encourage writers who are examining gender roles and imagining futures that are very different from today. The James Tiptree Jr. Award was created in 1991 to honor Alice Sheldon, who wrote under the pseudonym James Tiptree, Jr. By her choice of a masculine pen name, Sheldon helped break down the imaginary barrier between “women’s writing” and “men’s writing.” Her insightful short stories were notable for their thoughtful examination of the roles of men and women in our society. Since its inception, the Tiptree Award has been an award with an attitude. As a political statement, as a means of involving people at the grassroots level, as an excuse to eat cookies, and as an attempt to strike the proper ironic note, the award has been financed through bake sales held at science fiction conventions across the United States, as well as in England and Australia. Fundraising efforts have included auctions conducted by Ellen Klages and Sumana Harihareswara, the sale of t-shirts and aprons created by collage artist and silk screener Freddie Baer, and the publication of four anthologies of award winners and honor-listed stories. These anthologies, along with other Tiptree publications, can be purchased through tiptree.org/store. This entry was posted in Awards and tagged Gabriela Damián Miravete, Tiptree Award by Mike Glyer. Bookmark the permalink. Has the L. Timmel Duchamp book fallen through a time-vortex – you have it published in 2108! It is on my Kindle in my unread collection (along with far too many others) so I guess it is a typo.